PLAY AND LAUGHTER are normal occupations of young children. It’s how they learn about the world and how to engage with it and each other. And how to relieve themselves of the stresses of their challenging encounters with it. For millions of children enduring and displaced by wars and hardship, however, the new normal is despair, fear and trauma. There’s little to laugh about when your home and neighbourhood have been destroyed by bombs, members of your family have been killed and you now live in a refugee camp, suffering poverty, hunger, disease and the harshness of the elements. But laughter is what Clowns Without Borders seeks to provide. The organisation had its beginnings in Spain in 1993, when schoolchildren in Barcelona asked a Spanish clown to perform for refugees in the Istrian peninsula of Croatia. 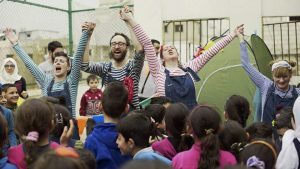 It has now spread around the world, with chapters in 14 countries bringing performing artists to visit the children in refugee camps, conflict zones and areas beset by emergency. 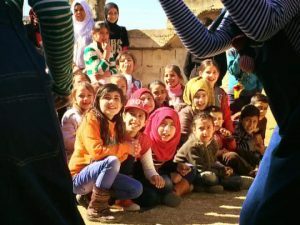 Their performances give these children a chance to escape, however briefly, their hardships and anguish with a few hours of light-hearted joy. 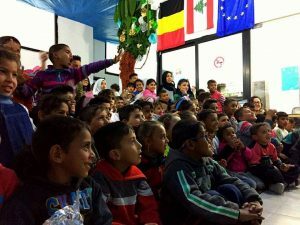 Putting into practice their motto “No child without a smile”, CWB Ireland’s tour of 19 different locations included Palestinian camps such as Burj Barajneh in Beirut of Nahr el-Bared in Tripoli/Trablus, and new encampments of Syrian refugees in rural areas such as the Beqaa valley. This was the second time round in Lebanon for Gregg, the leader of the group. She had expected the situation mostly to encompass the Syrian conflict and its refugees. The additional experience of going to the Palestinian camps that have been in existence in the 1940s – “where the residents are the descendants of those people who fled the Arab-Israeli war of that time” and are born as refugees, Gregg explains – was an eye-opener. The experience was special not only for the children. “To be honest,” Gregg says, “the work is a gift to us. To be afforded the opportunity to connect with people from cultures and life experiences so different from our own, both children and adults, is a rare thing.” She describes meeting tiny Syrian children in the Beqaa valley, who fled with their families to – or were born in – the windowless shacks and muddy fields near the Syrian border, and “making them smile and laugh with our messing, being gifted with their hugs and kisses”. Every interaction was important to them, she says: “It’s terribly sad and yet wonderful at the same time to be able to make that human connection, to share fun together and bring the memory of them home.